Boss Katana-50 - "Small Katana amp offers offers great value for money." 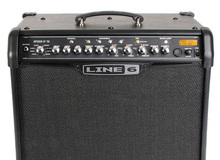 Line 6 Duoverb - "Duoverb - Hidden Gem"
Marshall Code 50 - "A great amp with a nice Marshall sound"
Marshall Code 25 - "Many sounds in a small, lightweight box"
Vox AV30 - "Just great!" Fender Champion 100 - "Cool Fender Amp"
Peavey Vypyr 75 - "Great tube tone using Transtube technology!" Boss Katana-100 - "AMAZING AMPLIFIER THAT JUST KEEPS SUPRISING ME!" Boss Katana-100 - "A true game changer from Boss"
Roland Cube-20XL - "Wish we could do 0.5 star increments..."